Welcome to the new weekly feature here @ adithisammasews ! This will also be my first linky list ever. You can link up Weekly Happenings in your city related to Sewing, Fashion, Crafts etc. 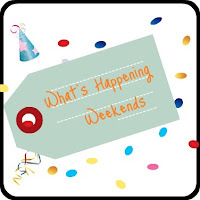 Please join in and support Whats Happening Weekend Linky Party. I am eager to know what's happening in your city/town. Please Follow AdithisAmmaSews. You can follow through Google Friend Connect, Facebook or twitter, choice is yours. Do Visit Other Events posted in the Linky Party and get to more what's happening where! - Comments are Most Welcome as always! I am more of a home bird and rarely step out and i wanted to break out of that mould and get to know my city better. This is as much as a commitment to myself as it is for you readers, to go and check out new places and be part of happening events in town. What's Happening This Weekend for me in my city - Chennai? How is it related to sewing & crafts, simple i get access to of books related to it. Let me see what i can get hold of this year!!!! I look forward to this event every year since my college days and this year is no different. Will update you all on tomorrow with my finds at the fair. There were loads of stuff for kids and i ended up hoarding one too many for my DD. Art of Magic book was the one that stood of for me, hope she learns some of those tricks up her sleeve in near future! I ended up searching the entire fair for the one book on Tailoring Saree Blouses by Indira Kasinathan Titled 'Thaiyyal Nunkalai' and found it at last at Leo Book Publishers store. Will share the knowledge i gain on nuances on drafting the blouse from this book soon. Though i quiet aware of drafting techniques for the blouse, i hope this book will help me iron out minor flaws that occur due to improper body measurements. Adithi's Amma, Thanks for the book recommendation. Can you share on more Indian books on Tailoring/Sewing for Indian clothes.